The frustration at not being able to check emails etc finally got too much today and so, after teaching Form I how to use a protractor and then wait until two other people had used it, I decided a visit to the Internet Hut was called for. Having seen both the headmaster, Mr Masue, and Mr Mmari riding off on the back of motorbikes I asked if there was a number for the local Action Bike’s. Mr Mmari rang his next door neighbour, whose son is a willing chauffeur, and after an agreed price of 60p, I mounted the back of his bike for the journey to Pangani. The words Babu and ‘Pole pole’ soon came out and he very carefully transported me down THE HILL and on the way to the Internet. Having arrived their safely and found, of all people, Denis in there collating some photos, I did what was required on the net, paid my 40p and left. I decided the easiest way to get back was to walk to the market, where some of the local bikers gathered, and get a lift. I tried the stationers first, but still no coloured ink in the printer, so it was a sweltering walk to the market. 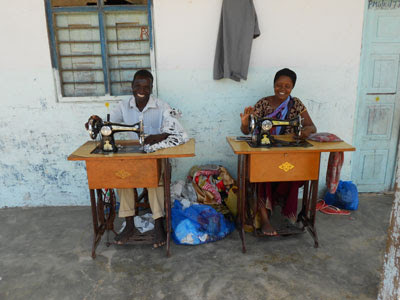 On the way I saw the couple in the photo below together in their sewing, using a couple of machines that are very common in Pangani and with the electricity problems I’d been having, I couldn't blame them for keeping it green. Another photo I've got to print out as ‘payment’ for allowing me to snoop on their lives. I eventually arrived at the market and entered at the same corner as ‘The Salon’ and who should be outside but my friendly barber. I went over, lowered my head, and contritely said, “Pole sana” (I’m very sorry) and explained what Denis had told me (in pigeon Swahili). This awakened his memory of the humour of the occasion and in true Tanzanian fashion he kept clapping his hand down on mine as we reminisced on our previous meeting. By the time I could drag myself away, the heat in my hand had nothing to do with the sun. I quickly found that, not surprisingly, the journey back up THE HILL is more expensive than the trip down and even after attempting to play one rider off against another I couldn't barter the price down from Tsh2 000 (80p) so I mounted for the return journey. The engines of the local bikes are not very big and I am sure the owner wondered if he should have asked for more shillingi as he approached the school and dropped from 3rd gear to 2nd and finally to 1st as he struggled with this large muzungu on the back. The round trip was money well spent and certainly beat repeating the climb I had already faced once today. 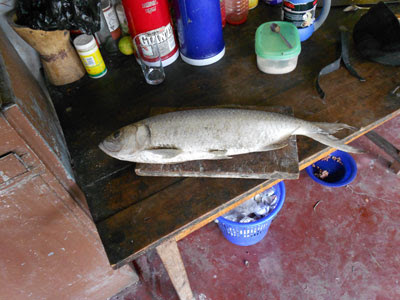 Upon returning home I found Vicky at the door, with the weighing scales out, bartering with two of the local fishermen, and when I looked at the table, I knew kuku and beef were off the menu yet again.